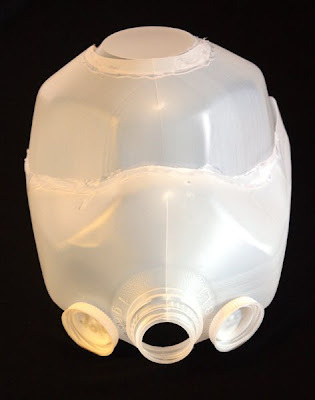 Milk jug storm trooper helmet. Pumpkin carving from last year. Halloween apple printing, hand printing and stencil making. Milk Jug trick or treat pumpkin pots. 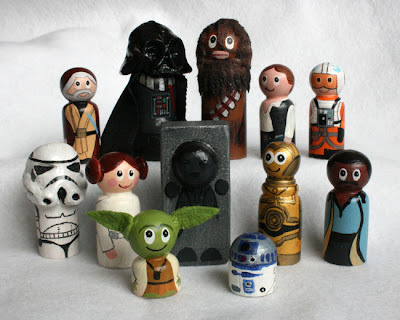 There haven't been any bloggable projects as such this week. 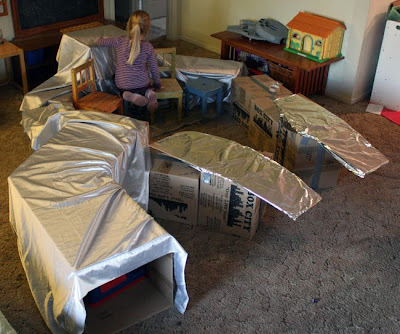 It's more been a week of make believe, in that there's been a lot of den building. 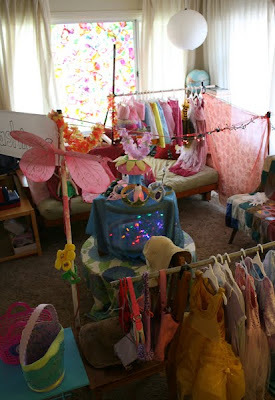 The kids (well, mainly my four year old) really wanted to make a "fairy fashion shop" in the livingroom, so for days we had all the furniture moved around and piled up in weird ways in an attempt to fake a boutique, including half the chairs from the kitchen. 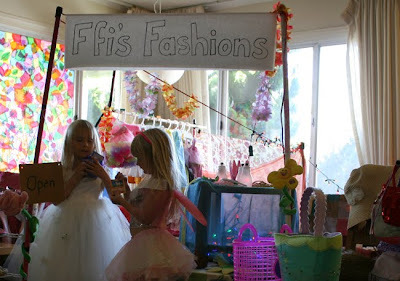 The livingroom was also stuffed full of every dress up dress, scarf, regular dress, kid's shoes, and well anything that was considered girly looking enough to be sold in a fairy fashion shop. I helped them to use electrical tape to fix some PVC plumbing pipes between chairs to make the rails for the clothes to hang on and we used every long stick thing we could find, even the broom handle to make the shop front and "fitting rooms". 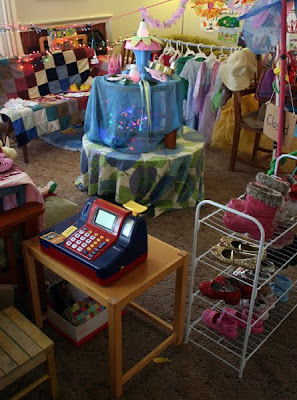 My older daughter's Christmas present a couple of years ago was a toy cash register, so that made the store totally real in their eyes. We have humungous stores every now and again. I think the last one was a pet shop that lasted for about a week (It slayed me that it had an all purpose "amphibian and reptile tank" where frogs and alligators seemed to co-exist quite happily). Anne-Marie and Sara, if you're reading this, thank you so much for passing on all the lovely dress up clothes! We wouldn't have had such an impressive selection without your generosity! Lots of little girls came over to play and enjoy this nonsense over the course of the week. 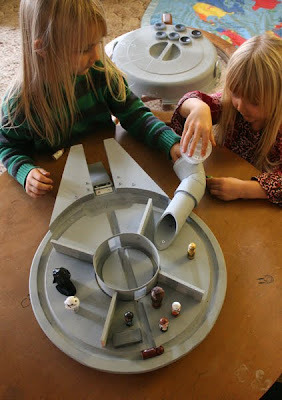 At the end of the week I was looking after a couple of little boys at short notice and that night we decided to make the millenium falcon out of boxes in the livingroom. One of our mates redecorated recently and had a lot of boxes that he gave us, so that was perfect! I had a horrendous silver sheet that I found at a thrift store that we threw over most of it. I dread to think the 80s-tastic yuppy boudoir that monstrosity was originally purchased for! I only got the one lame photo before it was too dark. Thanks Rich for all those boxes! I'm sure they will become many more things in the future. Oh and we're making another pinata. I swear out of all the messy stuff I let the kids do, making pinatas has to be the most unfathomably sticky and gloopy. Next time I have to remember to make everyone wear a swimming cap! Right, on to the awesomeness that is stuff that you lot have made! In no particular order (because really, c'mon, do you think I'm organized enough to have anything in any kind of order?!) Click through and have a gander! Heather at "Blog She Wrote" did our Duplo word blocks. Kudos for that, because it takes quite a while to sort all the little stickers out for it. Rachelle at Tinkerlab made a load of the craft foam bath murals from last month. I have to keep an eye out for some of the glittery craft foam, because Ffi would love that! Steph at Snickerdoodle added some of the craft foam bath murals in a gift package she was putting together. They look really sweet packaged up that way! I might have to make a couple of extra little kits and put them in the kid's stockings at Christmas. One more for the craft foam bath mural gang, over at "This Girl Loves to Talk". I try to show my kids these versions of our projects that other kids get to have a go at and when they saw this one they said we needed to make some tiny houses for the fairies to go in our garden set. Gorgeous gorgeous versions of our painted skirts over at Sparkling Adventures! More from "This Girl Loves to Talk". They adapted the rolled newspaper pirate swords I did for Alphamom to be Musketeer swords. Over at Juise, they made our Fall leaf rubbing mural from last year. I love the rainbow colours. Ours is still up on the wall in the kitchen. 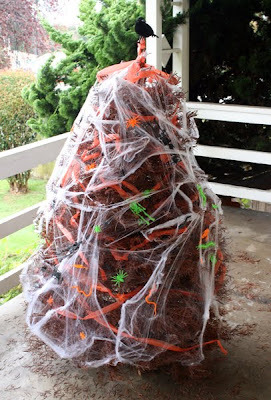 I did mean to take it down when fall was over, but became rather attached to it's mellow warmth, so it stayed. We'll have to make another soon! More plasticine stamping over at "Tout un Fil". Really cute version of our iron on plastic bag decals, using a Smokey Bear bag, over at "A look into our life". 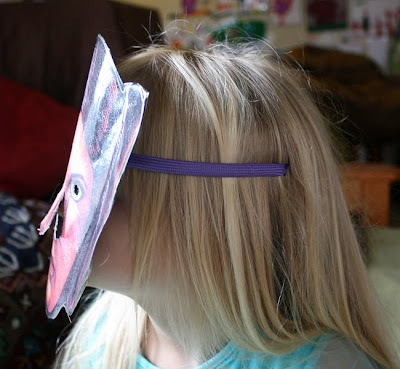 "Let's Promote Play" shows kids making a version of our stained glass tissue paper window. More colourful tissue paper window fun at Bangalore Kaleidoscope. Lovely bright double window of tissue paper stained glass over at Many Skies Mama. Blast from the past for me to hear about Putti Prapancha making our cardboard pizza from over a year and a half ago. It's very cool to find out that some of our older posts are still useful to people. As usual, all links are to other people's versions of our projects. if you want to see our posts that inspired them then I believe each of the readers posts does link back to the Filth Wizardry one. Keep making messy art and telling me about it, because it helps me to feel justified in writing another blog post about the mess we just made, rather than cleaning it up. Well, you know how we go with phases of obsession here. 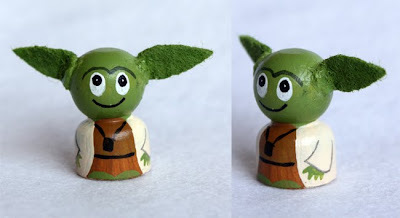 It was fairies a while back and now it's Star Wars. 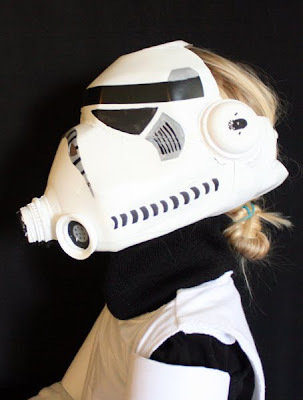 I thought it was worth putting this post up right away because with it being Halloween soon, there must be a few of you that are looking for budget Storm Trooper costume solutions (especially if you have more than one kid that wants to dress up as a storm trooper!). 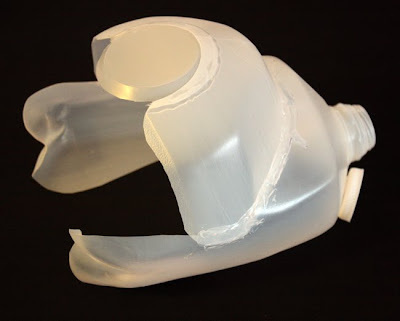 All you need for this are a couple of gallon size milk jugs (with their lids/caps), some hot glue and something you can cut them up with (I used an exacto knife, but it would probably be doable with a good pair of scissors because the plastic is quite thin). These are the shapes I cut out of them to use. 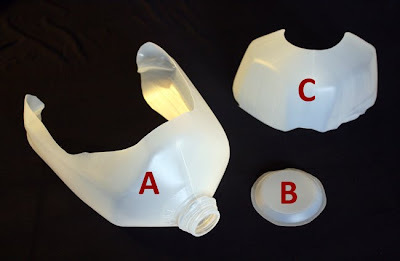 Pieces A and B are cut from the first milk jug and then piece C is cut from the second milk jug. This really was a prototype, so next time I think I'd go for a taller piece as section C. I guess it depends on the size of the head you're making it for though. 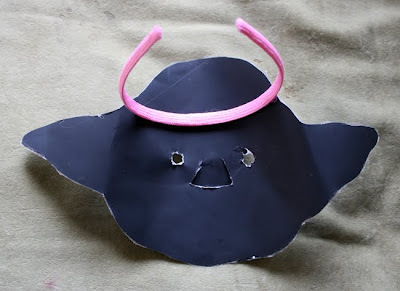 My kids are four and just turned six, so petit was the aim of the game with this helmet. 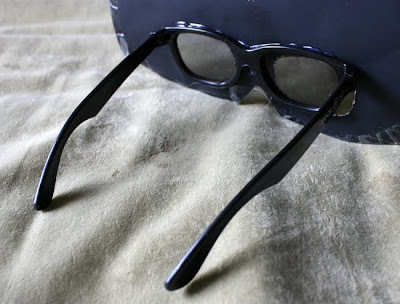 I used hot hotglue, rather than the low temp stuff, in order to try and secure the pieces together more firmly. 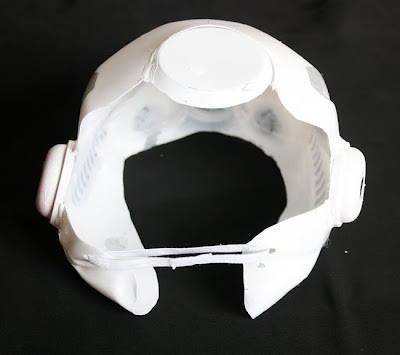 As you can see from these photos, piece A was the lower front and sides of the helmet and piece C is the front of the helmet from the nose up. 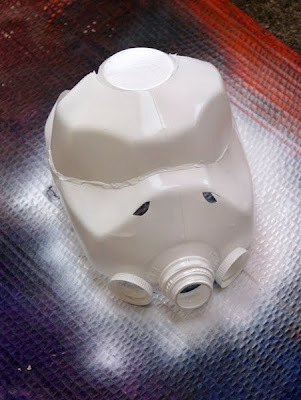 The pouring top part of the milk jug had to be cut off to make piece C, so to cover up that and make the helmet a bit more aesthetically pleasing I cut out the circular indent from the side bit that was left over from first milk jug. This fitted in nicely to fill that hole. I hole punched the back of the two protruding side panels so that I could put in elastic to hold it on. 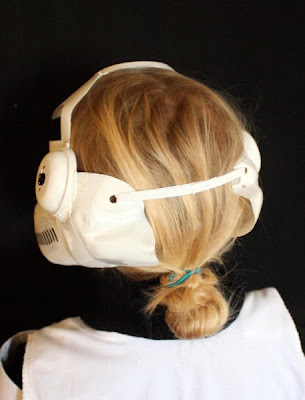 It's not a "full helmet", but it is significantly more than a mask. 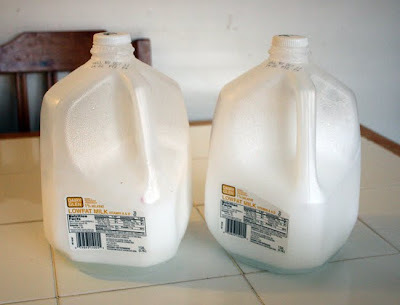 I then glued the two lids of the milk jugs on either side of the mouth part. 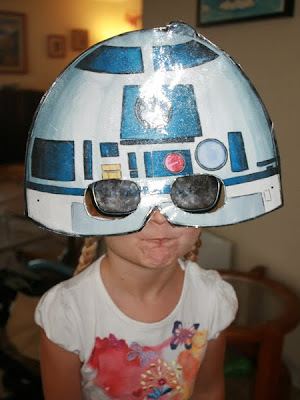 Once the structure was all glued together I popped it on my daughter to figure out where the eye holes needed to go. 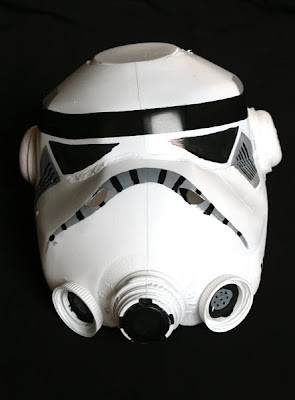 It wasn't going to work to have the eye holes cut where the storm trooper's eyes actually are, but with the milk jug being partially see through, it was easy to see where to put them and it worked out that I could hide them pretty well in the decorations afterwards. I had a can of white spray paint, so I used that on it. You could paint it with acrylic craft paint though, or if you are smart then you could deliberately get the totally opaque white milk jugs to start with! Here it is painted up with black, white and grey craft paint. 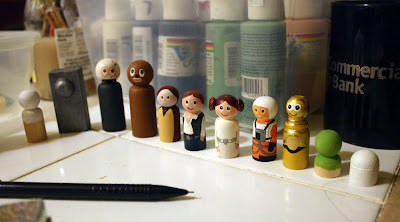 I had the paint out already from making the peg dolls, but a grey and black sharpie marker would do the job. I decided at the last minute to put the ear cover things on (they are made from the bottom plastic sections from the containers you get from the 50cent toy dispensers around here). The horizontal black line around the forehead is just a strip of black electrical tape. As far as clothing went, I just used a back long sleeved top with a white vest over it. I didn't have a poloneck/turtleneck so I just gave them a black dollar store ear warmer band to put on around their neck. 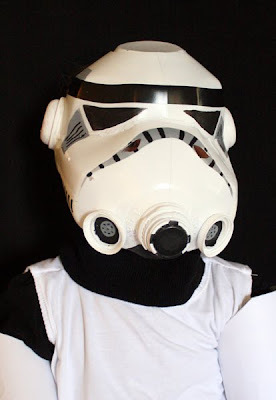 I didn't get as far as doing anything for the lower half of this outfit, because the kids are happy to just run around in it as it is (they want to be Darth Vader and Princess Leia for halloween anyway). 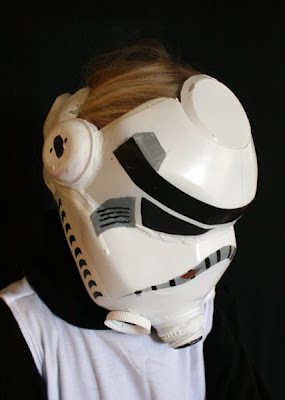 I hope this is useful for a few of you that have wannabe storm troopers. It's not totally accurate and if I did it again then I'd change a couple of things, like removing the front nossle to make a better version of the mouth area, but it's good enough that most young kids will be happy with it. 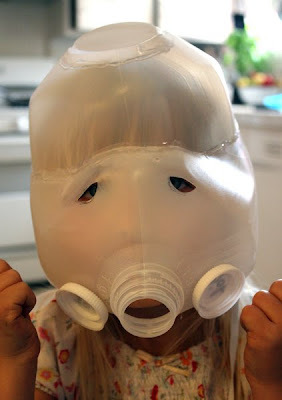 Oooh, or there are the milk jug batman masks too, here. I'd forgotten how much we mess about with milk jugs! 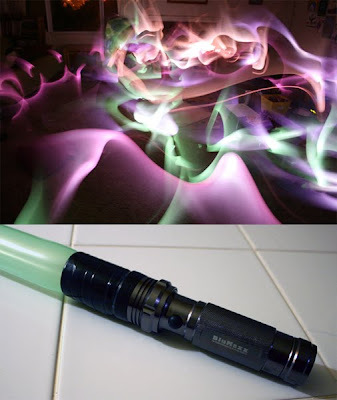 Another Star Wars related thing that might come in handy for trick or treating is the torch and balloon light saber hack that I posted at the beginning of this year. 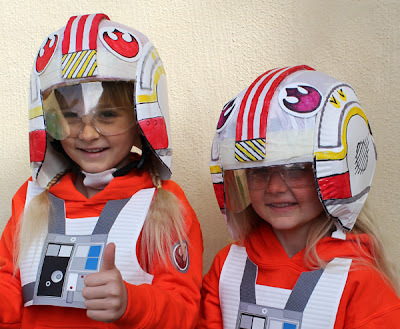 Update: A while after this we made some cheap and easy x-wing pilot's helmets for the kids to lark around in. You can see those here. 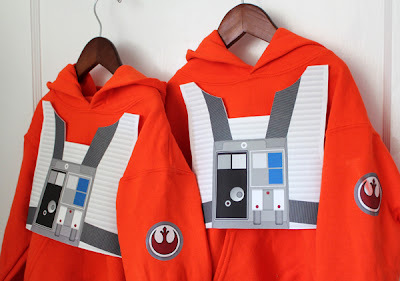 There is also a post here with a printable x-wing flight suit iron on thingy that I made for the kids to go on some orange hoodies. 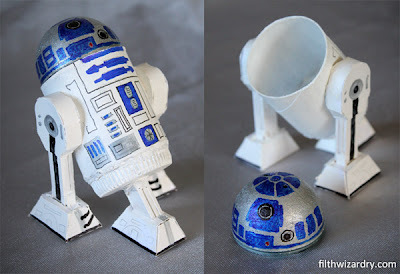 Last of all, if you like the Star Wars toys out of stuff from the recycling bin, then you might like the R2-D2 secret storage boxes that we made, here. Oh, no, wait, one more... 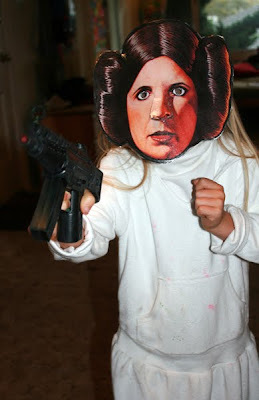 There's a bunch of Star Wars peg dolls that I made my daughter for her birthday, and the Millennium Falcon doll house that her dad made to go with them. You can see those here and here. 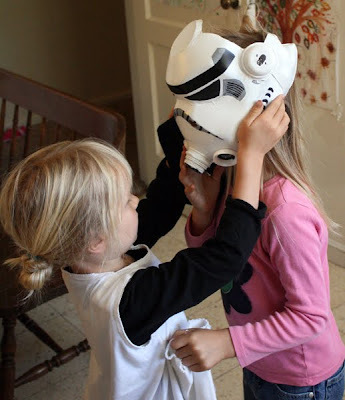 The kids are wildly into Star Wars at the moment. 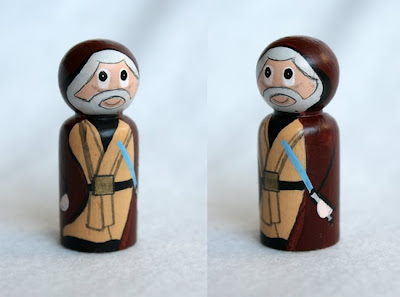 Have you seen the price of Star Wars toys!?! Good grief! Even second hand they are still mighty pricey unless you get lucky. 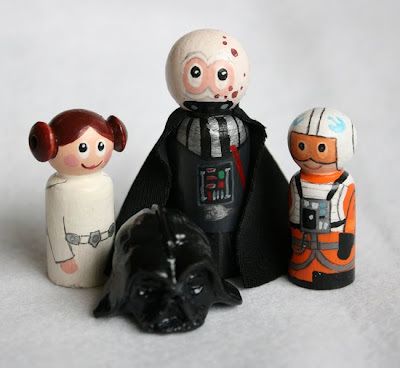 So, I've been painting peg dolls and we've all been making space ships out of recycling again. First I'll show you the ones the kids helped to make, then I'll show you the birthday present me and Paul made for our older daughter, who turned six yesterday. 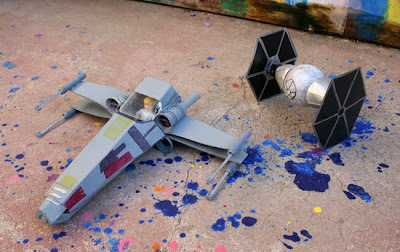 Me and the kids made an x-wing and a tie fighter one evening a couple of weeks ago, when I should have been making dinner. 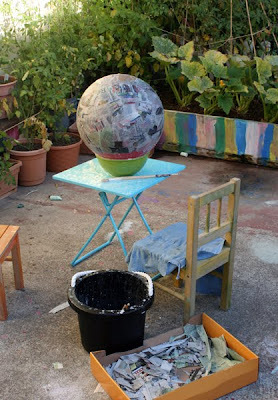 Just hot glue and stuff from the recycling bin, plus a bit of paint on top. 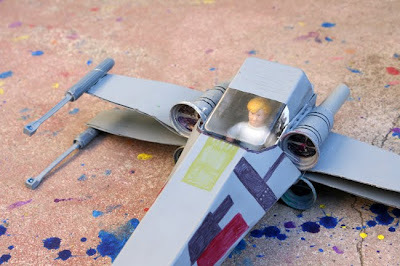 The x-wing was made from a small cardboard box for the body, a cereal box cut out for the wings, four corks for the engines, with pen lids on the tips of the wings and on the back of the engines. The guns coming out of the ends of the wing tip pen lids are snipped off electrical ties like the ones I used to make the insect antennae. The nose of the x-wing was made from strategically cutting a mac and cheese box and then glueing a bit of an egg carton to the end. The cork engines had a plastic lid stuck on the front of each (from a quarter machine toy container). Lastly the cockpit cover was made from a clear plastic wood screw box. 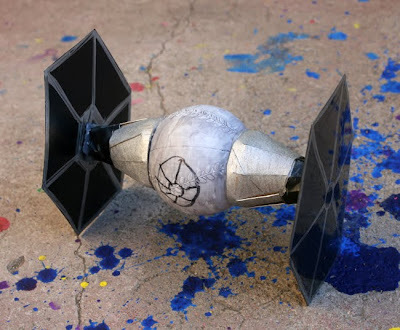 The tie fighter was made from a toilet roll tube, two cut out bits of plastic from the bottom of a black plastic Trader Joes chana masala tray (mmmmm curry!) and the middle is just a left over plastic baseball from when we did the vuvuzela craft a while back. I love the wonky little cockpit window that my four year old drew on it. 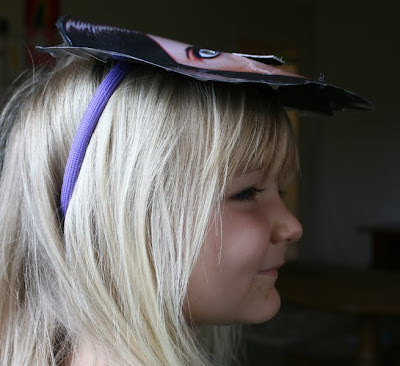 These have been a huge hit with the kids. 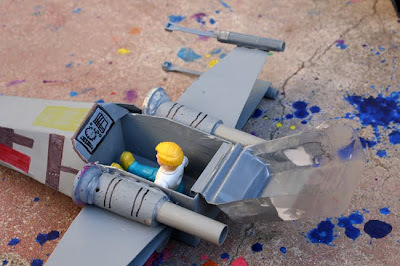 My older daughter was particularly excited about the x-wing because the pilot actually went inside it. 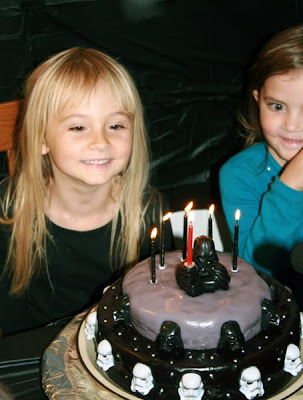 They were so into them that I was on the verge of helping them to turn a couple of old frisbies into the Millenium Falcon, but Carys's birthday was a week away and so me and Paul decided to secretly make her a more robust Falcon dollhouse for her present. 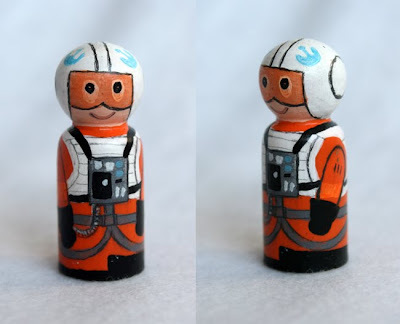 After I made Pixie Hollow for Ffion back in March, I wanted to do something equally home made for Carys and so we decided to spend a few evenings with me painting up peg dolls and Paul screwing various thrift store finds together to make the Falcon for them to go in. 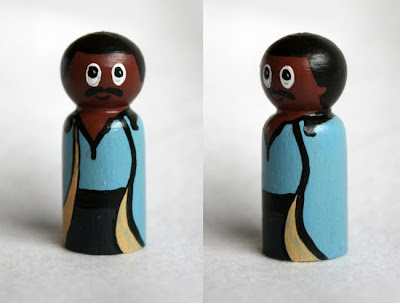 I painted up all the peg dolls over the course of four evenings, after the kids had gone to bed. They are really freaking small! It would have been much easier to use larger peg dolls, but these were the ones we could get cheaply at Michaels (didn't have time to wait for anything by mail), also I needed them to be able to fit into the doll house we were making for them. I used two sizes. 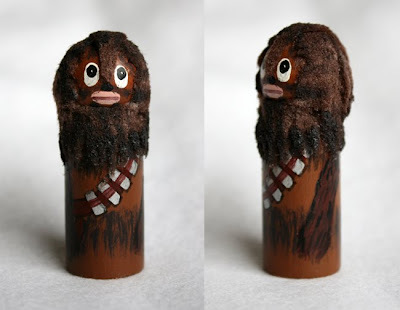 Darth Vader and Chewy are made from larger 2-3/8" blank peg dolls (they came in a packet of two) All the others were made from the little 1-5/8" peg dolls that came in packets of three. Some of them had bits chopped off and glued back together in weird ways to get the right sizes and shapes. Here's the only in progress photo I took (about half way through). The cute little faces were based on a great flikr set by Ty Lettau that I found via laughing squid, at just the right moment! 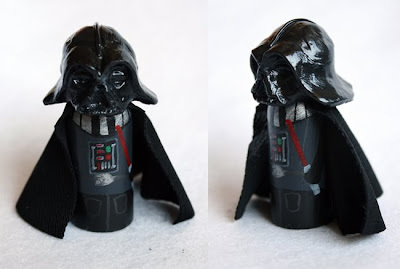 Vader and the storm trooper's masks were made by covering the peg in clingfilm/clingwrap and then molding Fimo clay into the right shape, then carefully pulling it off and baking it hard. It was fiddly, but I couldn't think of another way to make the helmets be realistic and fit the pegs correctly. 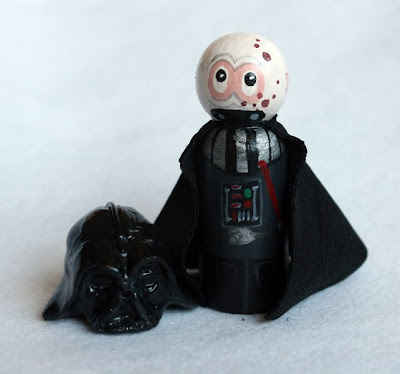 Vader's can be taken on and off to reveal his gnarly face when he decides to leave the dark side. 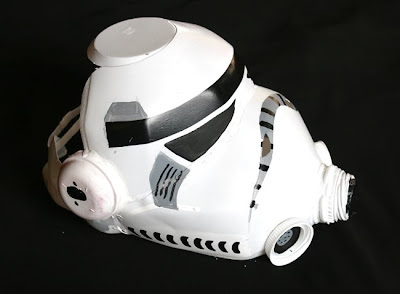 I glued on the storm trooper's helmet though. 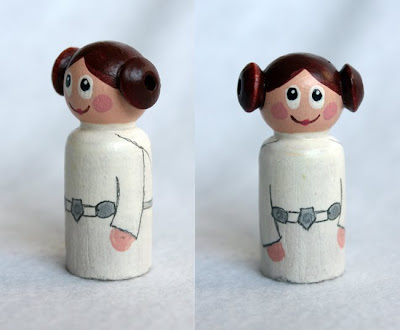 Leia's hair is a couple of wooden beads glued onto the sides of her head. 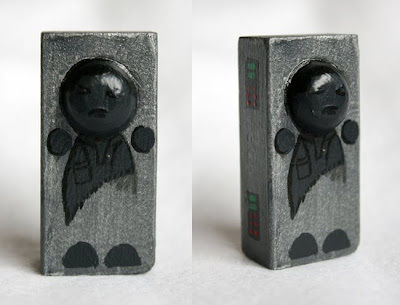 Han Solo in carbonite is a Jenga block with half of one of the peg doll's heads glued on. 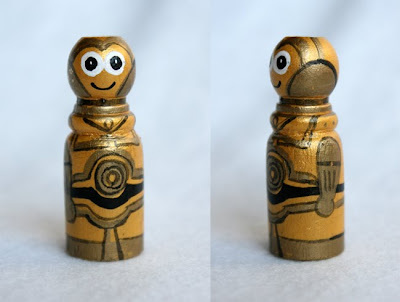 C3P0 had his head chopped off and replaced with a random smaller wooden head shaped thing I had handy. 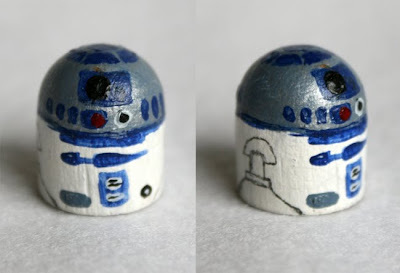 R2D2 was the bottom bit that we chopped off to make Yoda with another half a head glued on the top. 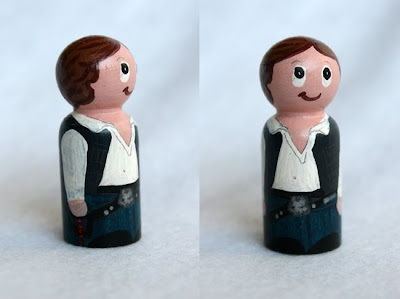 He's teeny (only 3/4" tall). 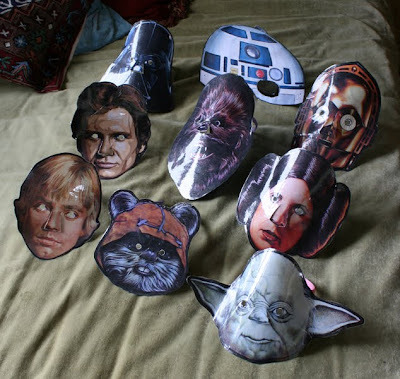 They are all painted with acrylic craft paint and have a couple of coats of satin finish Mod Podge to varnish them (Darth and the storm trouper's helmet are varnished with gloss Mod Podge) I superglued felt to Chewy's head and little felt ears to Yoda, which went rock hard once I painted and varnished it. Luke Skywalker in his X-wing flight suit. 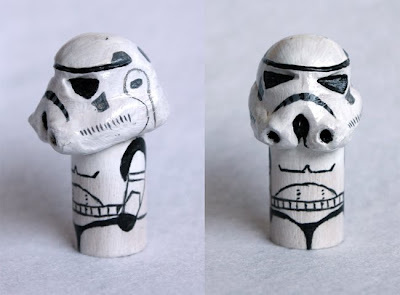 Storm Trooper. It was very late when I painted this little dude and I now realise that the way I painted his boby armour makes it look like he's wearing a thong. Nice. 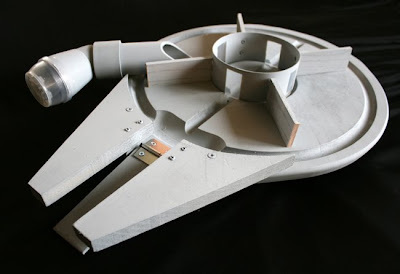 Paul has written a post on his blog "Fangletronics" showing how we put together the Millenium Falcon dollhouse from random thrift store finds and recycling. So if you want to see all the bits that went into making the ship below then pop over to his post here. It's been played with almost constantly since the kids got it yesterday. It's always a relief when something you have spent a lot of time on is well received! Phew! 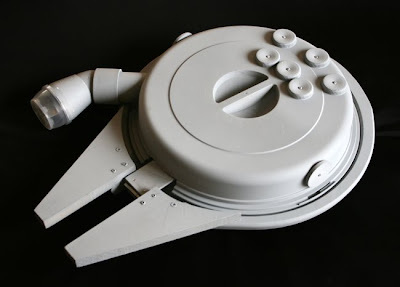 I think Paul did a good job making the falcon sturdy, so hopefully it'll last for a long time.